Written by Melissa on Aug. 5, 2015 in Development. 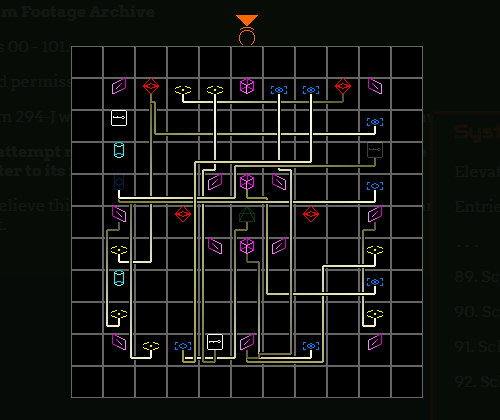 I've just finished creating puzzles for the latest piece of free content in Exploit: Zero Day, and it was my first time doing a considered design of puzzles. I wanted a few levels of difficulty, but for puzzles to not just become obnoxious as the difficulty increased. The puzzles I've designed will be going live later this week, and hopefully folks will like them. I iterated quite a bit on some of them as I tried out different tactics, especially the puzzle pictured with this post. When it was all said and done—which took a while, since I was new to it—I was able to distill the tactics I used into this handy-dandy list. Last update on Aug. 5, 2015 .